Description: Detailed clear larg political map of South Dakota showing cities, towns, county formations, roads highway, US highways and State routes. 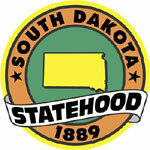 South Dakota is a state in the Midwestern part of the country of United States. It is the southern half of the Dakota Territory and the capital of this state is Pierre. The largest city in South Dakota is Sioux Falls. During the year 2008 census, it was found that the state has a population of about 804,194 people. South Dakota has been divided in to two by the Missouri River. On the western part of the state, ranching is the main activity and on the eastern part of South Dakota, agriculture is the chief activity because the land has fertile soil that is fit for growing crops. The longest and the largest River in this state is the Missouri River. The other main rivers in South Dakota consist of White, Big Sioux, James and Cheyenne Rivers. The eastern part of this state has quite a few natural lakes and majority of these were created because of periods of glaciations. There are two national parks in this state and both these national parks are situated on the southwestern part of South Dakota. The majority of the people living in this state are whites. Some of the large ethnic groups here are the English, Native Americans, Germans, Irish and Norwegians. Physical map and map image of South Dakota.